I’m sorry — unlike knitting magazines, I can’t take my sock pictures on scenic outdoor rocks, so you’ll have to settle for my scenic indoor couch. I’d never let Pat go for a walk on the beach in his handknit socks, anyway! 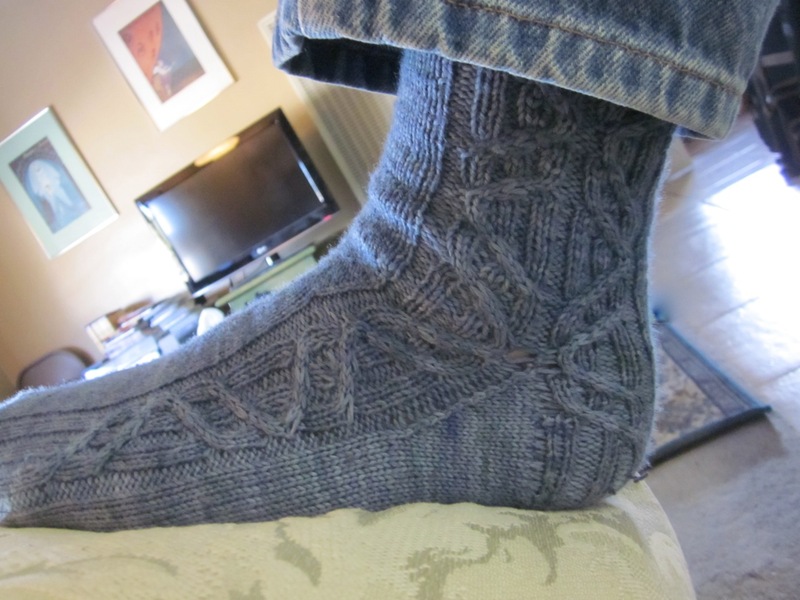 These are his Christmas socks, a little belatedly blogged. The pattern is Deflect by Hunter Hammersen, from Knitty’s Deep Fall 2013 issue. The yarn is Oink Pigments Sock in “Misplaced Marbles.” I got it at the Torrance Fiber Festival this year — I guess I never did a post about my haul, but it was quite small: just this, bought expressly for these socks, and a skein of gorgeous laceweight purple that you’ll see pretty soon when I make it into a spring lace project of some kind. I was on a mission to buy yarn for this pattern when I was there, and I bought this one because the color was good for ManSocks(TM), and because it felt and looked very similar to Dream in Color Everlasting Sock, which is what the pattern actually calls for. When I got it home and compared it to the skein of Everlasting Sock that I had at home, it was so identical that I think they might even actually be the same yarn base! Even the colorway was pretty similar, though I’d judged the skein I had as “too girly” — more on that later. This yarn looks a little darker and bluer here than it actually is — in person it’s closer to photo #1, though that one’s a tiny bit washed out. 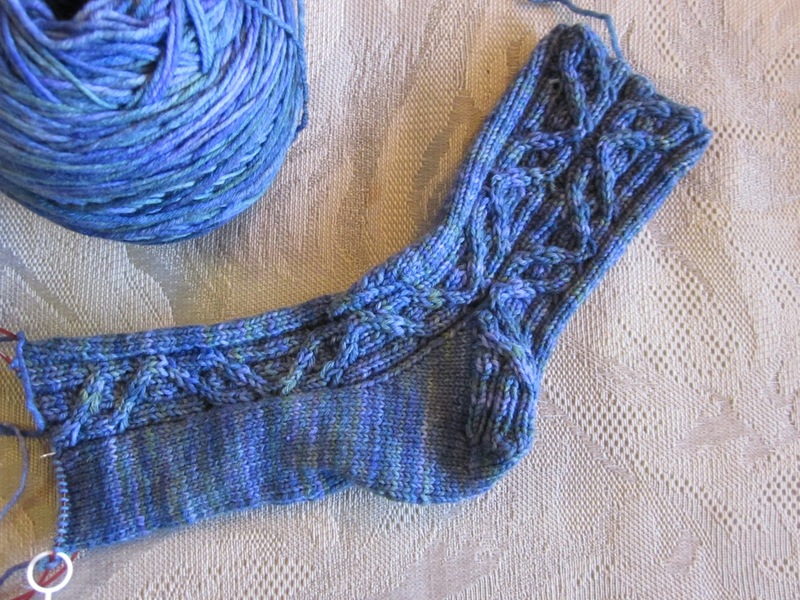 I enjoyed knitting these socks, though I think I ran into a minor problem with the numbers on the heel in the large size. It’s been awhile, so I don’t remember the specifics, but it was just very clearly a mistake in the number of stitches that I should have ended up with or something. Easy to spot and ignore. 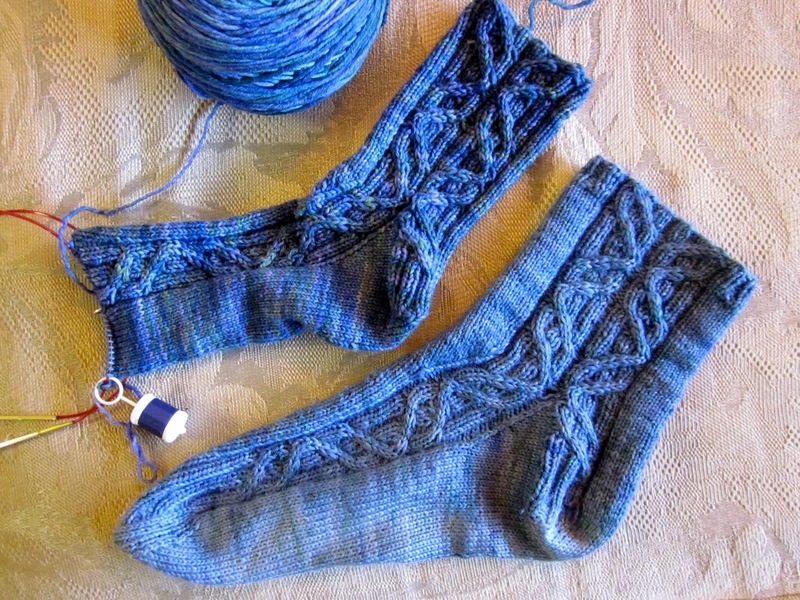 I just love the way the cables are arranged in this sock! 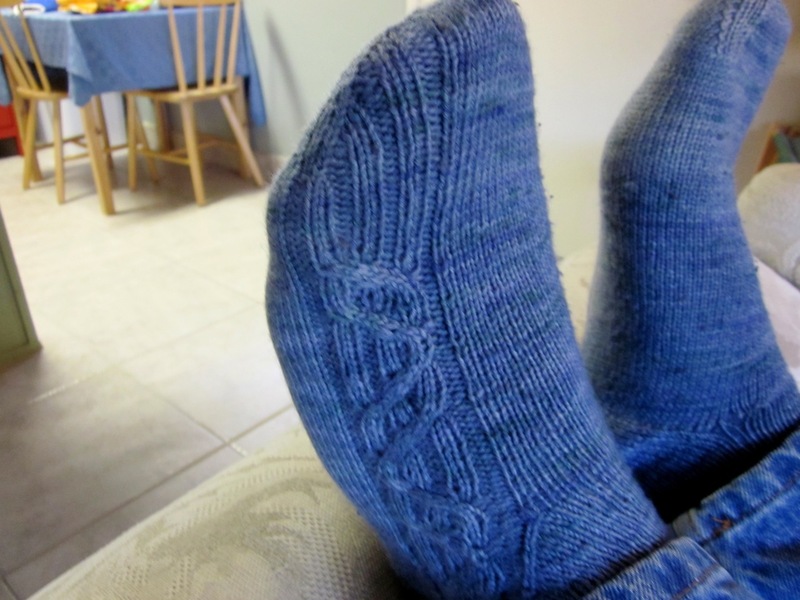 And the toe is gorgeous — I was a little skeptical as I was knitting it, since it seemed like the decreases were happening in unorthodox places, but it looked great when it was done and on the foot. 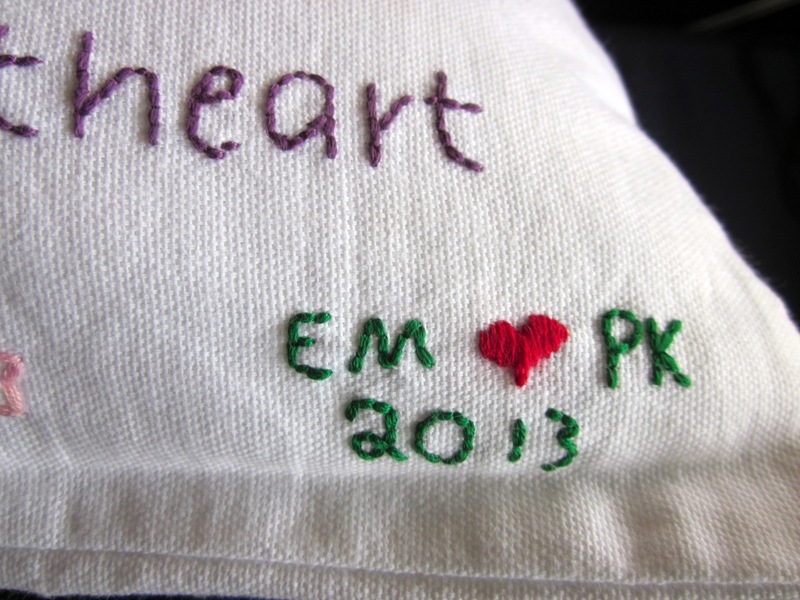 Some news: I taught myself to embroider over winter break! Also, Pat and I got engaged! 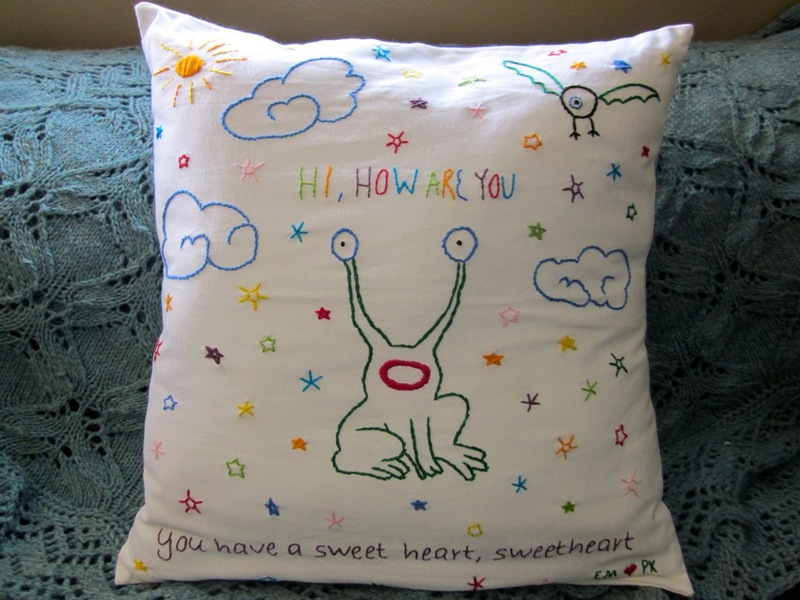 We spent the holidays apart, with our respective families, and during that time I secretly taught myself to embroider and made this pillow here as a Christmas present for Pat. He proposed shortly before we exchanged gifts, but he says that if he hadn’t been planning to propose anyway, this pillow would probably have done the trick. I used split stitch on him, and satin stitch on the mouth. 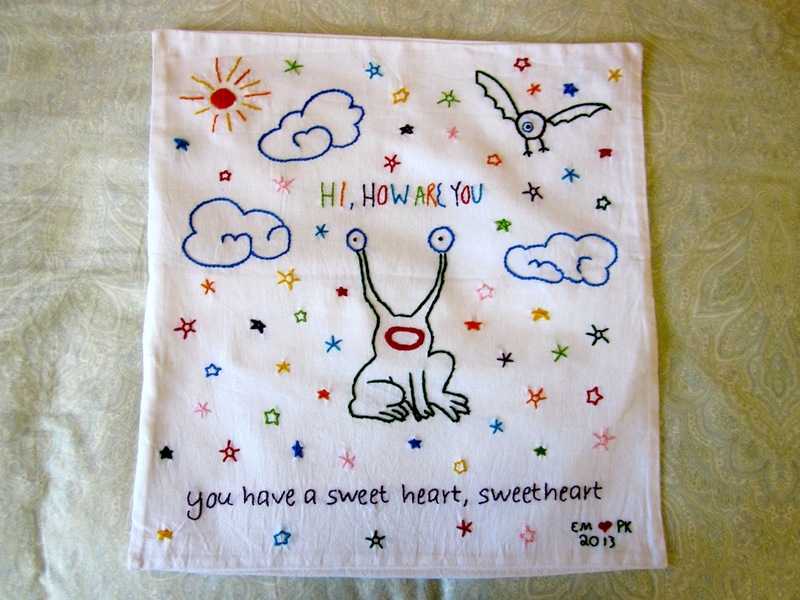 He was the first element I embroidered; later on I discovered vine stitch, which I used on the clouds, and I like it better than split stitch because it’s neater. I got the idea for this whole project from knitting Totoro in December. I’d done incidental embroidery before in my knitting, but never considered myself very good at it until that project, where it was crucial that I make Totoro’s face look awesome or the whole thing would end up looking creepy. I was pleased with how well I did, and realized that embroidery is not actually very difficult — it’s basically just tracing plus patience. 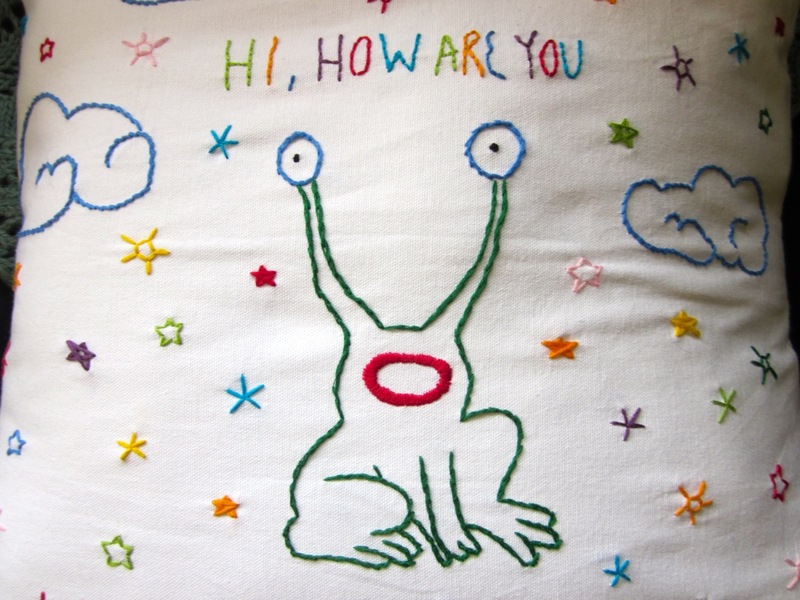 I’d already discovered Sublime Stitching through their french knot tutorial I used for my Zeldaphant, and in poking around again when I was working on Totoro I found the Daniel Johnston patterns, and that made the light bulb go off in my head since Pat is a big fan. Furthermore, I had a substantial collection of embroidery floss leftover from my summer-camp friendship-bracelet-making days. That’s right: with the exception of the dark green for the frog, 100% of this embroidery floss dates from the late ’80s and early ’90s. The clouds here were made using vine stitch, which I ended up liking the look of better than split stitch. 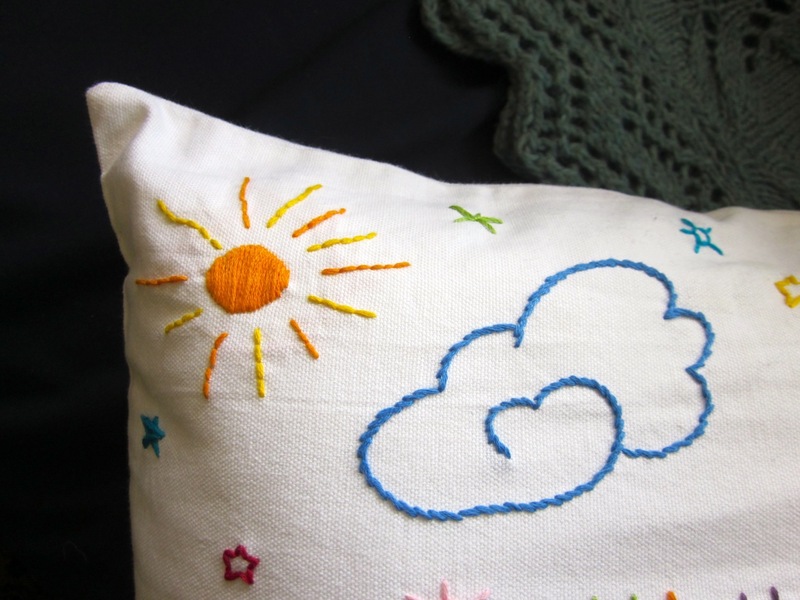 The sun’s rays are backstitch, and the sun itself is of course satin stitch. One of the choices it turns out you have to make when you’re embroidering from a pattern is how to transfer that pattern to your work. I decided to buy an embroidery transfer pen (which washes out with cold water), and use my parents’ windows as a crude lightbox to trace my printed-out images onto the pillow cover (which is also from Sublime Stitching, by the way). Another choice I considered was iron-transfer pencils, but I don’t think that they wash out, which was a dealbreaker for me — I didn’t want to count on myself to make zero mistakes while tracing, not to mention zero mistakes while embroidering to cover over the lines I drew. 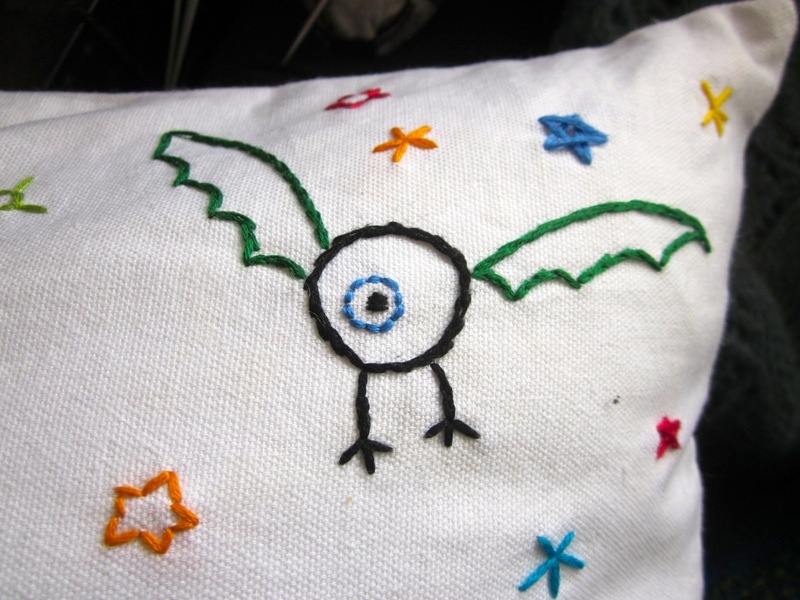 The eyeball monster here was also made using split stitch. I didn’t start experimenting with vine stitch until I made the clouds. Yay! I’m sorry I’ve been gone so long — I’ve been knitting, but I also recently started a new job that’s eating up tons of my time. I hope to catch you up on some of my knitting soon! So here’s to new adventures!